I'm going to try and keep this short and unsentimental. This blog has come to an end. This blog is no more. It has ceased to be. It's expired and gone to meet its maker. It's a stiff. Bereft of life. It rests in peace. Its metabolic processes are now history. It's kicked the bucket. It's shuffled off this mortal coil, run down the curtain and joined the bleedin' choir eternal. This is an ex-blog. Now for the good news: The all-new This Game of Games V.2 is up and running. Just as The Godfather, Part 2 was better than The Godfather, TGOG V.2 will be an improvement over the original. There's going to be a blog and I'll keep posting original research on a semi-daily basis but there's so much more at the new place. Rather than tell you about it, I encourage you to head on over and take a look at it for yourself. For all of my friends who are link-illiterate, the new site is at thisgameofgames.com. Go there now. The new site is still in development and I have a lot of work to do, lots of content to get up. 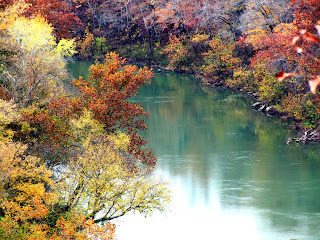 But the blog is live and I'm putting up new content as fast as I can. 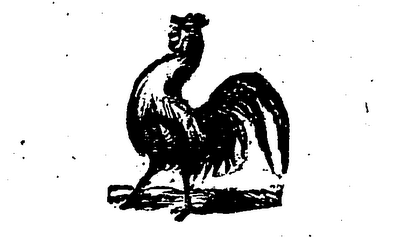 When I finish, I expect TGOG V.2 to be the finest 19th century baseball website in the known universe. The Southern Base Ball Club, of New Orleans, arrived in the city last night, and are stopping at the St. Nicholas. They play a match on Monday with the Unions, and on Tuesday with the Empires. The reference to the St. Nicholas is a bit puzzling. 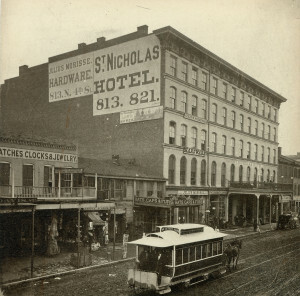 The famous St. Nicholas Hotel in St. Louis was designed by Louis Sullivan and built in 1893 but it appears that there was an earlier St. Nicholas on Fourth Street that was in operation by the 1870s. Based on the above piece from the Republican, it must have been open by 1869. So I got a new phone this week and it kind of automatically synched everything with my Google account. When it synched, it added all of the pics that I posted to the blog to my phone gallery. To conserve space, I, without thinking, deleted all of those pics from the phone. Now it turns out that doing so probably deleted all of those pics from my Google account and, since Blogger is part of Google, from the blog. So, to summarize: new phone, deleted pics, no pics on blog. I'll probably go back and add the pics to the posts on the front page but there is no way that I'm going to go and add all of the pics to all of the posts. Unless I can figure something else out, which appears unlikely, that stuff is gone forever. It's a tough break but it should just motivate me to get the new site up and running quickly. It's time to move on and since I just screwed the pooch here, I might as well do it now. So here's the plan. There's a post scheduled to go up tomorrow and then I'm going to go dark for a bit. I have a big project for Protoball that I have to finish and that is going to take a few days. 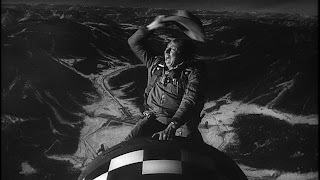 After that, I'll try to bang out enough content to launch the new site and move the blog over there. The new address will be thisgameofgames.com and I'll post something here in the way of a formal announcement next week. I'm shooting for May 3 for the relaunch of the blog and the website will probably be live sometime Memorial Day weekend. Like they say, when God closes a door, he opens a window. Losing the pics is a bit of bummer but I'm just going to look forward to launching the new site. I have to thank Bob Wilke for bringing the problem to my attention yesterday. Without Bob tipping me off, it may have taken a few more days for me to even notice what was going on. So that's that and we're moving forward or onward or upward to the all new This Game Of Games. Stay tuned for the official announcement, links and all of that stuff next week. Update: I've gone back and fixed the posts on the front page but everything else is gone for good. I have all of the box scores and pics on my laptop so they're not exactly lost but they're gone from the website. In the great scheme of things, it's not a complete and total disaster. I'll keep you informed about the launch of the new site and hope to see you there. As the season for out-door sports advances, so it seems does the general interest augment in our national game, as is evidenced by the large number of clubs and the many match games being played in our city; and of course those games wherever the leading clubs are the contestants attract the larger attendance and the greater excitement. The recent trip of the "Empire," besides being a successful and honorable one to the club, will be productive of bringing here for the gratification of the public some of the leading clubs from the East, among them the old and well-known "Haymakers," of Lansingburg, N.Y., and famous "Red Stockings," of Cincinnati. In addition, it is highly probable that the "Forest City," of Rockford, Ill., a club second to none, will put in an appearance during the fall season. Yesterday the interest was centered in the second game of the championship match between the Empire and Aetna clubs, and resulted, as did the first game, in favor of the former club, though not by so large odds. The Aetna had out their full nine, with Whalen at his old position of pitcher, in which he did well. The Empires were obliged to call in requisition three of their second nine, being short of pitcher, centre field and second base. The game was a very handsome batting one, with quick, active fielding and base play, a game of which the Aetna need not feel chagrined if they were defeated. They did some tall batting and excellent fielding, but they were playing "The Empires." Love that last sentence and think I'm going to start referring to the Empire Club as The Empires from now on. And to the best of my knowledge, this was actually the third game between these clubs in 1869. They played on May 9 and May 23, both victories for The Empires. Last Saturday afternoon, I was going to watch the Cardinals take on the Rockies at Busch and stopped to watch a vintage baseball game that was played underneath the Arch. 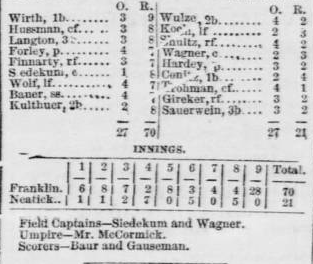 The first of five scheduled games, the RSG Squirrels, of Decatur, played the West Lafayette Couriers in an exciting match, using the 1860 rules. I had originally thought that the Cards were playing in the evening and I was going to get to watch vintage baseball all afternoon but I discovered that Saturday was an afternoon game and I only got to see most of the one game. It was kind of a shame because it was a beautiful afternoon, a beautiful place to play a match (as can be seen from the above photos) and I could have sat in the park, underneath the Arch and watched this for hours. While I didn't get to see as much as I wanted, it was a great deal of fun. Everybody on the clubs that I talked to were very friendly and you can tell that they enjoyed educating folks about their game. For that matter, I had a lot of fun talking about the game as it was played in 1860. Random people would come walking by and just stop, amazed at what they were seeing and wanting to know what the heck was going on. They loved it. You can tell that the game just captured everyone's imagination and that was encouraged by the obvious fun that the players were having. It was a great afternoon in St. Louis. 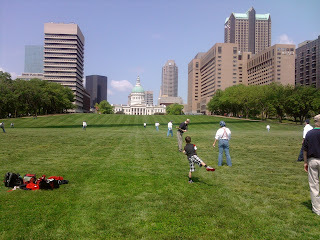 You had the vintage games under the Arch and, as we were walking to Busch, there were groups of people, here and there, playing catch. There were 43,000 people at the ballpark and Adam Wainwright took a no-hitter into the 8th, throwing a two-hit shutout as the Cards secured a 3-0 victory. The sun was shining, the beer was cold, the Cardinals were winning. This is what life is like in the best baseball city in America. It was a perfect baseball day and I honestly felt sorry for all the baseball fans in this country who don't live here and don't get to experience baseball the way that we do. The Eagle Base Ball Club, of this city, through their Secretary, have challenged the Silver Moon Base Club of Belleville to a match game of base ball. As yet, the Silver Moons have not accepted, but the probabilities are that they will do so. Is the first reference that I've found to the Silver Moons of Belleville. Don't know anything about them but that's a great name for a ball club. Buckeye 14, Empire 27; Kentucky 28, Empire 30; Eagle 24, Empire 35. A very interesting match game of base ball was played at Cedar Hill Park this afternoon, between the Empire Club, of St. Louis, and the Kentucky Cub, of Louisville, resulting in a victory for the former by two scores...The Empires will play the Eagles to-morrow afternoon. The weather was clear and pleasant; attendance large. In a return game of baseball played between the Franklin and Niatick clubs, the former were victorious, by a score of 70 to 21. These are two clubs that I don't know much about. The Niaticks (or Neaticks) are completely new to me while I only have one other mention of the Franklins, which comes from 1865. An exciting game came off on the 11th inst. between the [Miami and Liberty] clubs, for the junior championship, which resulted in the defeated of the latter by a score of 23 to 16 runs. The members of the Miami B.B. Club claim the junior championship of St. Louis. Challenges may be directed to Mr. Cannon's grocery, on Seventh, between O'Fallon street and Cass avenue. The Miami Club is new to me. The Liberty Club dates back to the Civil War and I have a specific mention of a senior club in 1865, so the junior club may date back that far. The silver ball match between the [Lone Star and Aetna] clubs was terminated by the game played on the morning of the 11th, at the B.B. 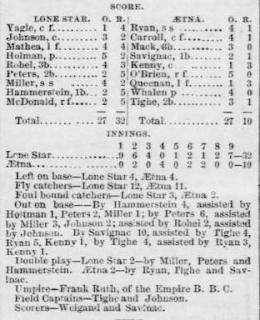 Park in favor of the Lone Star, in a score which is quite satisfactory to themselves, but "stunning" to the Aetnas, who were generally considered the stronger club. The latter club made a mistake, we think, which has been made before by others, too, than themselves, of underrating their opponents and not awaking from their delusion till too late. The Lone Star boys are quick and wide-awake, and no club has the right to hold them cheaply. The match between the Empire and Rowena took place on the afternoon of the 11th, at the Base Ball Park, and called forth a goodly attendance of the friends of either club. The Empire Club made a fine appearance on the field in their very handsome new uniforms, and also presented for the first time their new catcher, O'Ran, who made good play throughout the game, and will prove a valuable acquisition to the club. The "Rowenas" belong in South St. Louis; have a good reputation as ball players, and are a very fine appearing set of men, physically. It was evident from the early part of the game that they were not of sufficient calibre to successfully cope with their opponents, yet they played their "level best" with determination and with good nature, enjoying even their own discomfitures as heartily almost as the friends of their adversaries. Occasionally they gave an example of heavy batting, and throughout the game their infielders did well. The Empire Club was represented by its full first nine, though three of them were not really in good health. Their batting was excellent generally, but still there is a chance for improvement, by ceasing to bat "sky balls," of which they had several "muffed" by the Rowenas. Their throwing to bases and base-running were superior to anything hereabouts, and demonstrated their ability to play a first-class game with any "cousins" from abroad. In last Sunday's issue we gave a full report of the first game of best two in three for the championship between the Union and Empire Clubs of this city, in which the Unions were beaten by a score of 26 to 30. Yesterday afternoon the second match took place, the Empires being again victorious by a record of 36 to 31. The day was fine indeed, better weather could not have been desired. Mr. W.L. Jesse, of the "Valley Club," Frankfort, Ky., was chosen umpire, and, we may say here, rendered his decisions promptly, and without complaint from either side. The Empires won choice in the toss-up for position, and sent the Unions to bat. The game opened brilliantly for the Empires who, with Wirth for short stop, showed very strong. Our notes exhibit: Cabanne, Smith and Berning, all victims, one after the other on first inning, to the fielding of Barron, Murray and Spaulding, with Wirth at first base, who seemed destined to give the Unions no chance to pass his corner. The innings ended with a whitewash against the Unions, who, however, were not discouraged making their discomfiture nerve them to better playing. 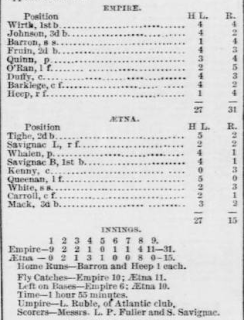 On their own first inning, the Empires scored five runs, Wirth, Spaulding, Barron, Murray and Fitzgibbons getting home, the inning ending with O'Connell falling a victim to Smith's fielding at 1 B, Shockey caught on fly by Berning and Wirth striking out. Score, 5 to nought in favor of the Empires. The Unions barely saved another whitewash on their second inning, Lucas getting 1 B on call, stealing second and making third and home on a wild throw by O'Connell. The Empires themselves did no better, making but one run, Heep scoring his run by a muff of Berning, and Wirth, Spaulding and Barrow being all three cut off at 1 B. Score, 6 to 1 for the Empires. On the third, the Unions made three against some fine playing. Easton, Turner and Smith getting home, Cabanne being a victim to Barron on a fly catch, as also Greenleaf to O'Connell. Berning was caught at 1 B. The Empires augmented their score by two runs, Murray and Shockey getting home, O'Connell and Fitzgibbons going out on the fly and Welch on 1 B. The fielding of the Unions told heavily in this play. Score 8 to 4 for Empires. The fourth inning increased the Unions' score to 8, Lucas, Easton, Turner and Cabanne getting home y some very swift running and bad fielding of their opponents. 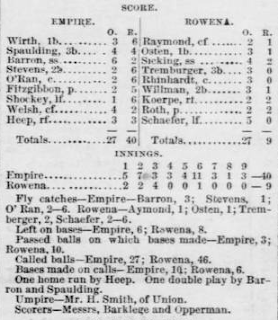 The Empire made a score of three through very hard work, though Spaulding, Barron and Murray got home by bad fielding of the Unions and a strong centre field hit by Murray. The fifth innings was all one sided, the The Empires getting a score of 7 to 1, with a splendid one-hand running fly catch by Spaulding, well fielded to Wirth, which was the feature of the innings. Score 18 to 9 for Empire. In the 6th innings, the Unions struck out in a sudden storm of batting, which not only disconcerted the reporters and scorers, but waked up the Empires to the fact that they had not only not won the game, but were in danger of losing it. Turner to centre field, Cabanne to left and Smith to centre, sent out some terrific balls, none of which were stopped; and they were followed by Strong, Lucas, Carr, Turner and Cabanne; the last two coming in for a second batting, the inning ending with a score of 11 - the finest work of the game. The Empire came out with a score of four, Welch doing the most noticeable work on a splendid bat to left field. Score 22 to 20 for Empires. In the seventh contest, the Unions went at their work with a courage nursed into boldness by their success in the last, being not a little encouraged by the applause of their friends among the spectators, and aided by the muffing of Shockey, Stevens and Fitzgibbons. They made an addition of 5 runs to their score. But the Empires were now waked up, too; and when they came on to bat, showed a renewal of their former energy. This, with the bad fielding of several of the Unions, gave them another heavy score of 8, leaving the count on the close of the seventh running 30 to 25 in their favor. There was great depression now on the part of the Unions' friends, and some of the nine themselves, we think, began to feel as if they had more to carry than they could get home with. The metal of the Empires did not flag; the seventh running gave them to believe they were the masters in the contest, and they played with a confidence based on success, which was wanting in the case of the others. So the eighth innings was entered on almost as if both parties were satisfied with the result. 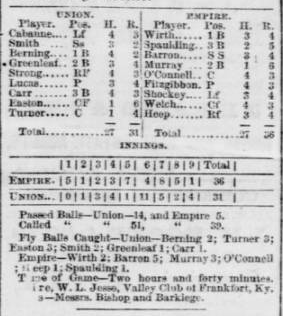 The Unions made two runs, but were discouraged by two successive foul catches by Barron, putting out Lucas and Carr. Turner made a very good bat to centre field, sending Strong and Easton home, and being himself left on base by a foul caught by Murray from Cabanne. But the game did not seem to take a final turn till Heep, having made his 1 B on an indifferent bat, went home on a wretchedly bad throw by Berning, which was soon followed with a similar fiasco by Smith, letting Spaulding home. The action of the Unions in this was partially redeemed, however, by a magnificent running fly catch by Easton, and a very fine fly by Smith putting out Stevens. Score 35 to 27 for Empires. The interest was of course more intense on the last innings; but it was easy to perceive that the game was "played." The innings, however, showed splendidly for the Unions, who contested the ground nobly, the score showing some excellent running and first rate batting. They yielded to a superb running foul fly by Murray, showing a score of four for the inning, and a total of 31. This of course gave the game to the Empires, who merely "walked over the course" with a score of one, to save a white-wash. Thus the game ended amid the shouts of the multitude, who crowded inside the ropes to congratulate and commiserate the victors and victims. There were cheers for the beaten first; then cheers for the "old belt" - and thereby hangs a tale: Some years ago there was a fine championship belt gotten up by honorary members of these clubs, to be played for by these same clubs. The game for the belt came off, and the Empires won it. It was held by them till (we believe) last season, when they yielded it to the Unions on a well-contested game for the championship and belt. Now, the old belt has to be returned to the original holders, with the glories of the championship of the State of Missouri. The interest manifested by the public in this game was evinced by the presence of at least two thousand people who witnessed the game. -This wasn't much of series, with the Empires winning the first two games. The first game was definitely the better of the two matches. -"A sudden storm of batting" is a great phrase and I need to start working that into my writing. -The two game accounts by the Republican where not particularly well written but I think they're significant. I can't think of an earlier game account from the local St. Louis papers that was more detailed than these two. They very well may be the first example, from a St. Louis paper, of that 19th century-style, detailed, inning-by-inning baseball reporting. I'm not exactly certain but, off the top of my head, I can't think of any detailed game accounts that predate this. -The stuff about the "old belt" is significant. I was aware of a championship belt prior to this but I believed that it was the belt that the Empire club fashioned for themselves in 1865, after claiming the mythical Championship of the West. This account states that there was another belt that the Unions and Empires competed for amongst themselves. It was a trophy for the winner of their annual contest. That's new information and adds a little color to our understanding of the Union/Empire rivalry. And it's another St. Louis, pioneer-era trophy that has been lost to the mists of time. The body of John Kane, a young man about 29 years of age, was recovered on Friday last from the Meramec river, in which he was drowned on Sunday. 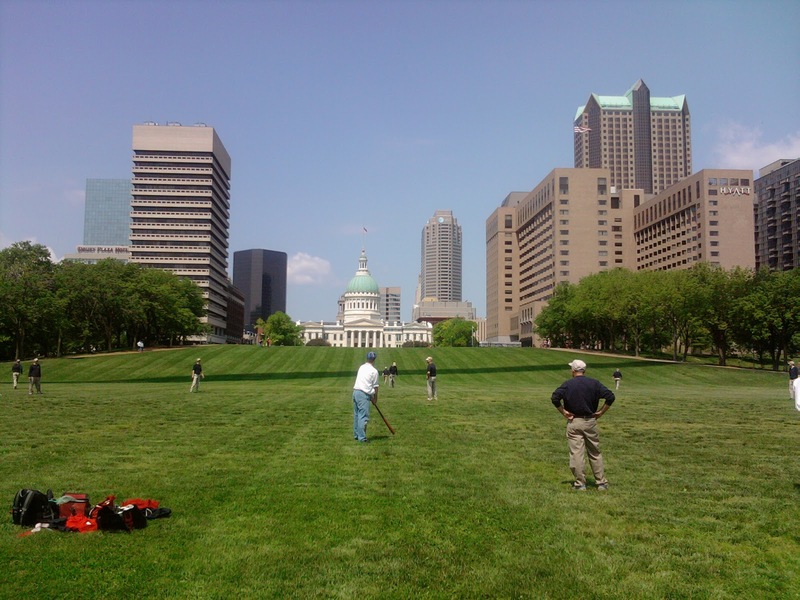 He was a resident of this city and was of a party of base ball players who went out to the Meramec river, on the Pacific Railroad, to play ball. Going in the river for a swim, he took cramp and was drowned. Kane is the third pioneer-era, St. Louis baseball player, along with Asa Smith and Alexander Crosman, who I'm aware of that met a watery end. The second game between the Union and Empire Clubs has been definitely appointed for Saturday the 5th, at St. Louis Base Ball Park. The interest manifested in the result of this match will call forth the best talent of both clubs, and, no doubt, a numerous attendance of spectators. 13th June - Lone Star vs. Atlantic; at Veto grounds. 8th July - Olympic, of Washington, D.C., vs. Union, of St. Louis; at Base Ball Park. We also understand that the first nine of the Empire Cub have been challenged for a game by the old players of this club, and that the match will take place shortly.